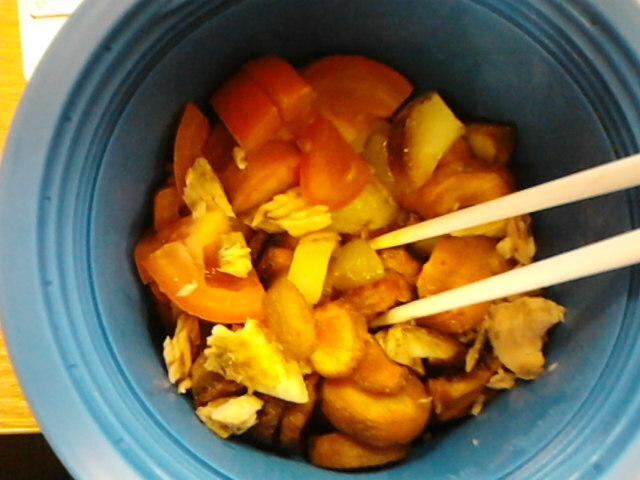 I have a simple mix of roasted potato and carrots with flaked salmon and tomatoes on top. 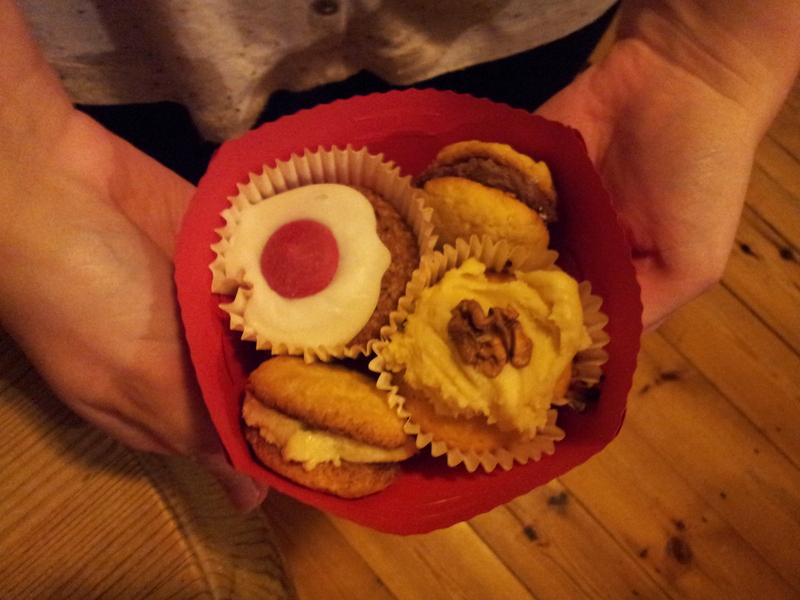 I’d already had a nibble before I took the photo, so it looks a bit depleted. I was sophisticated and used chopsticks with my lunch today 🙂 They help slow the pace of eating down and I also pay a lot more attention to my food than if I eat with a fork/spoon. How do you like your vegetables? Roasted, sautéed, steamed, fried? 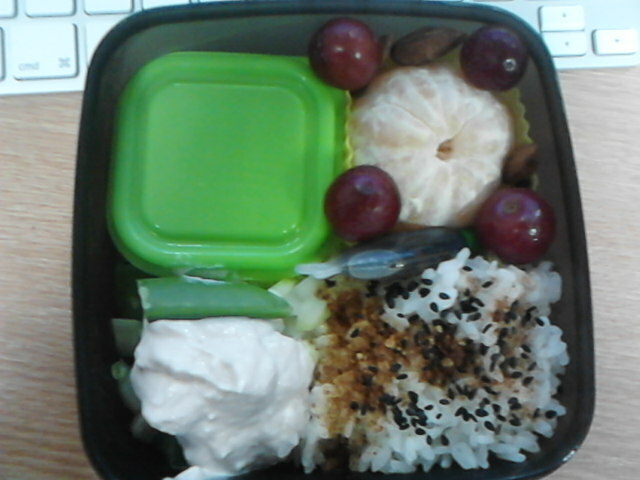 Yummy ‘mini’ Bento today! I don’t often eat bread, but I fancied a toasted sandwich for breakfast, then couldn’t eat it all!! Silly me! 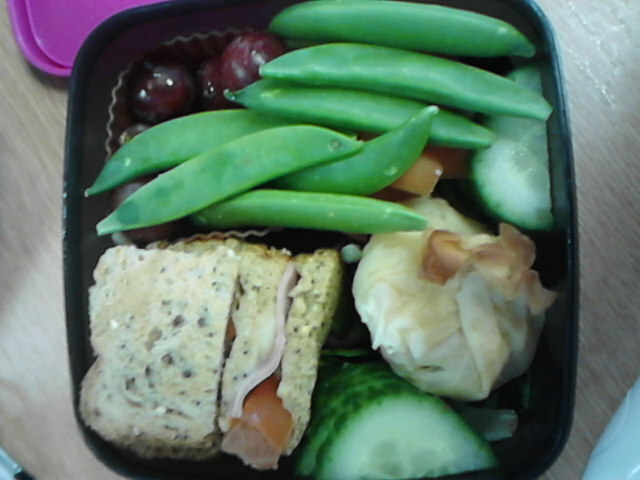 Today I had the rest of a toasted cheese, ham and tomato sandwich, salmon in filo pastry, cucumber, sugarsnap peas, grapes, and more tomato. It filled me right up! 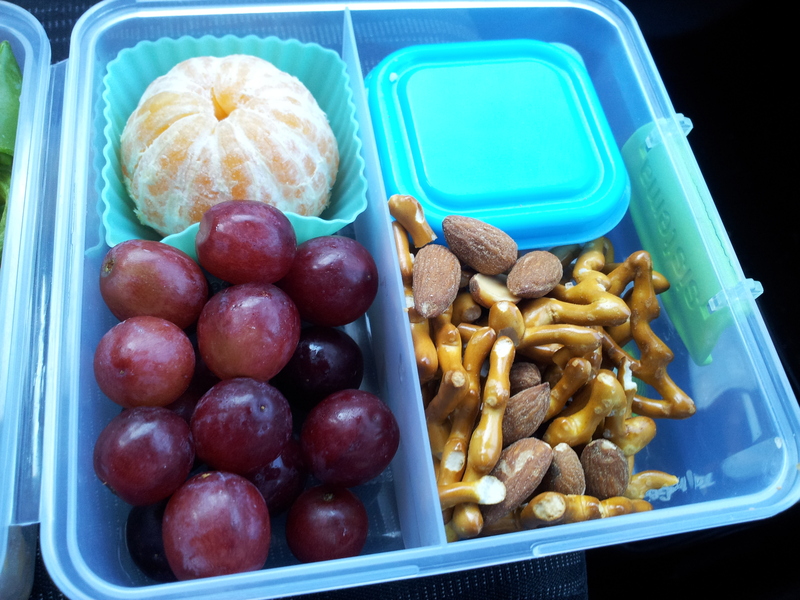 The smaller Bento boxes are much easier to fill with mainly healthy foods that don;t leave me bloated 😀 wooh! 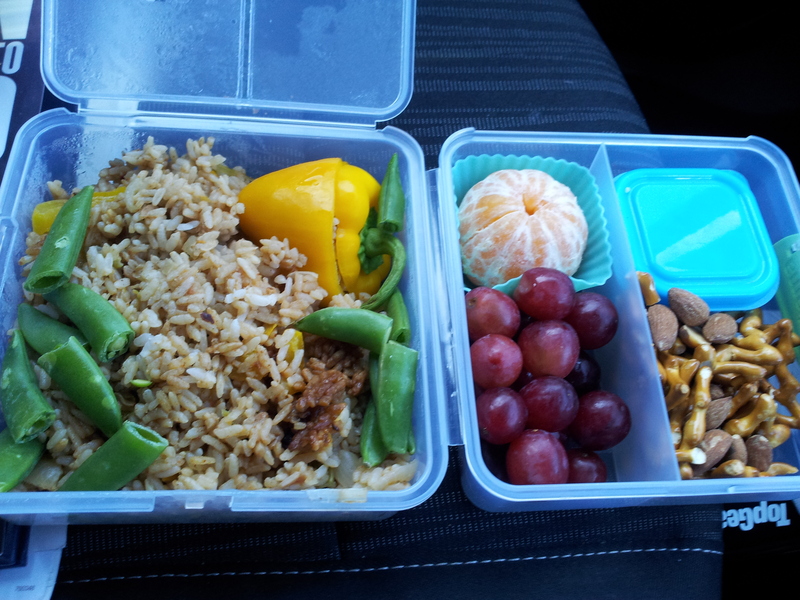 Who has recently umped on the Bento wagon? I’d love to hear all your Bento ideas and experiences! 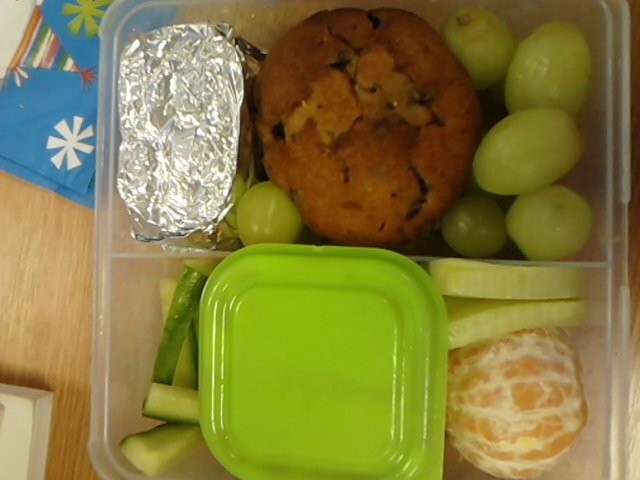 Super compact lunch today! For the bf, along with a flask of hot bean soup. 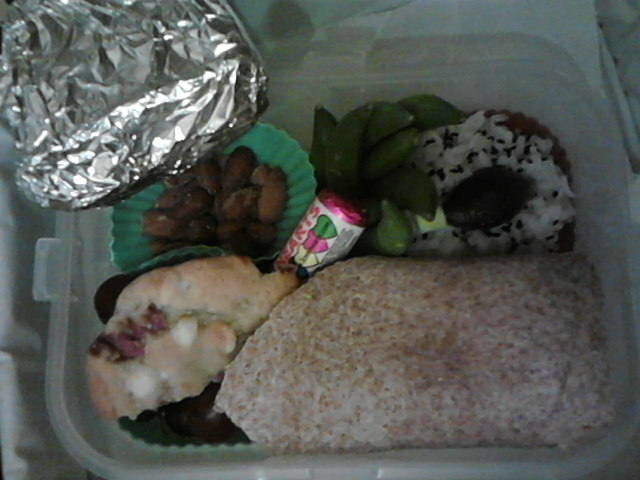 In the bento is a cheese, ham and salad wrap, small cup of sushi rice with sesame seeds and soy sauce, sugarsnap peas,love hearts, malt loaf, almonds, half a cookie and grapes. It’s making me hungry looking at that! 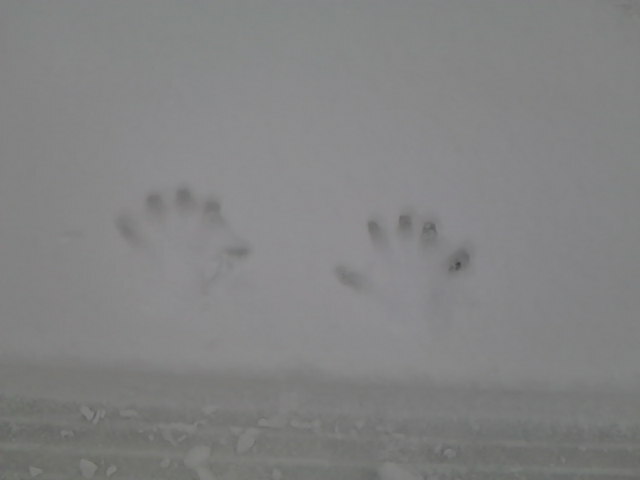 Excuse the bad picture. What light is best to take food photos in? 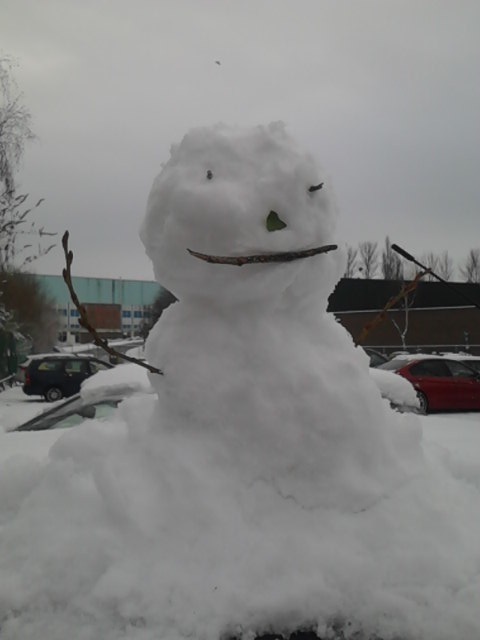 We had a Snow day at work today 😀 it was so snowy! 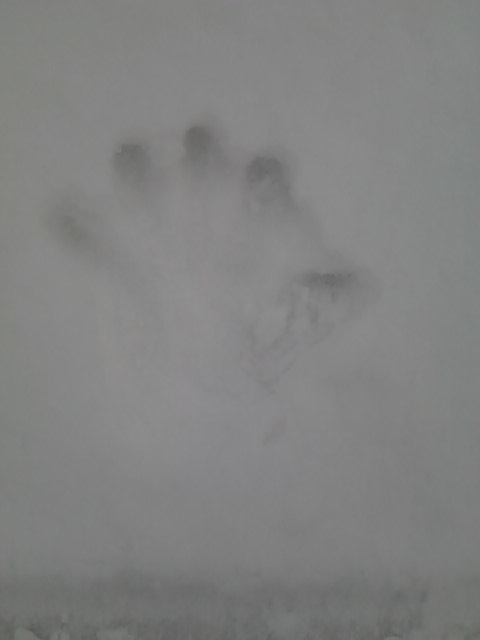 And I made a snowman, and a snow angel and snow hand-prints 🙂 I feel like a kid again! 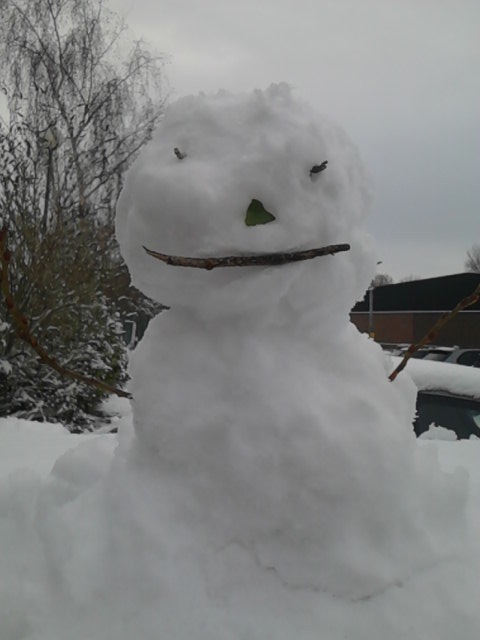 Before he received his face, almost invisible! 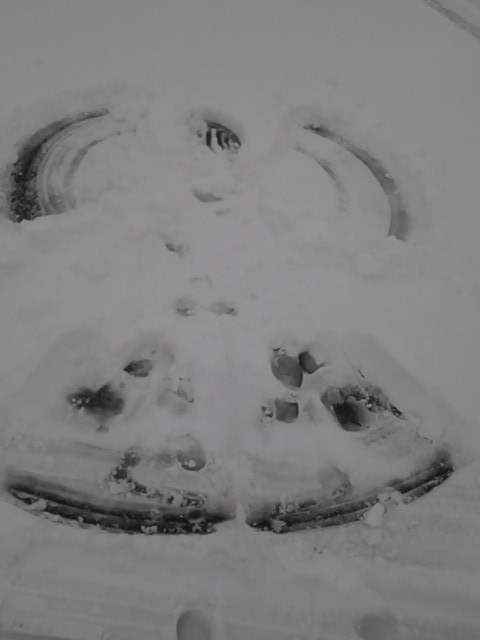 Snow Angel! 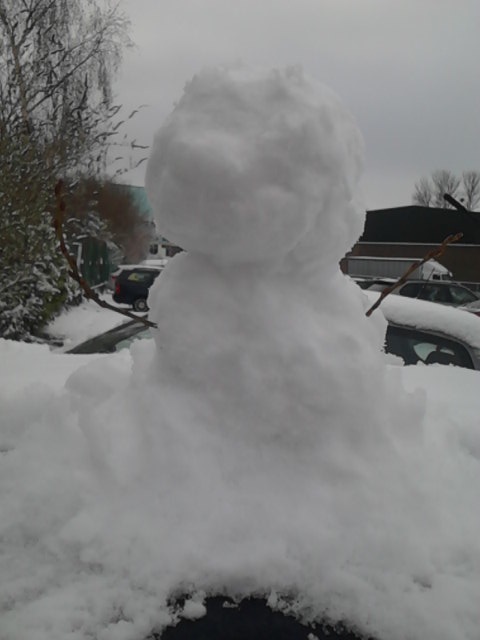 I got such a cold bum!! 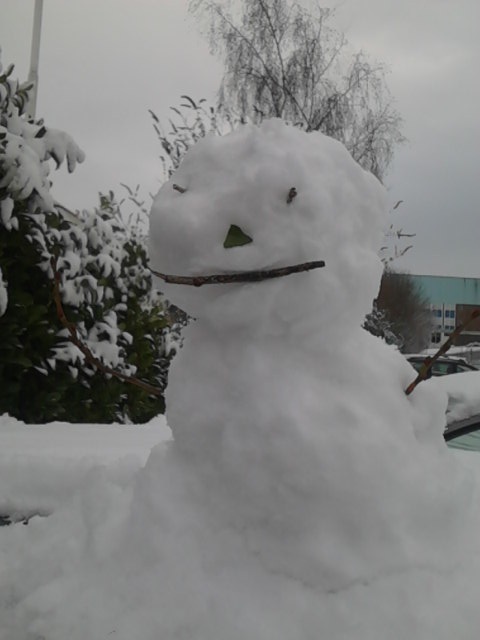 Happy Snow Day UK! It’s snowing 🙂 yay! 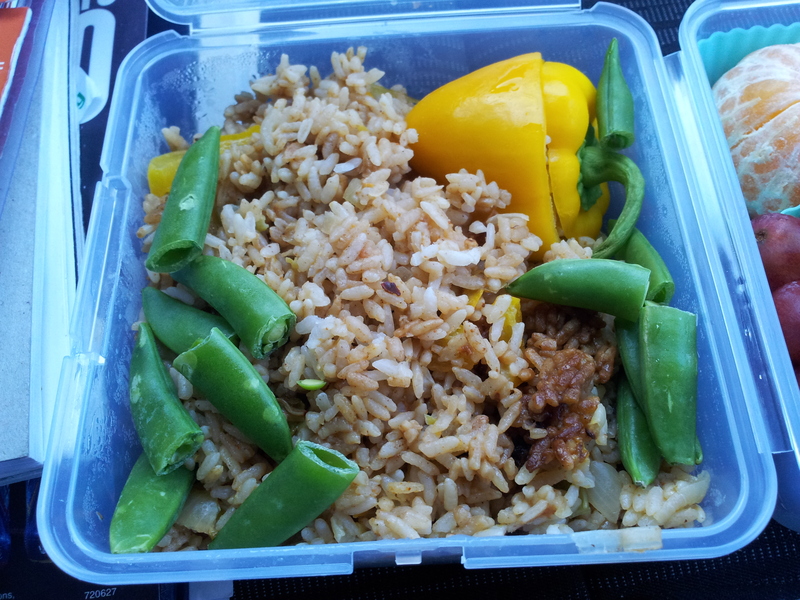 I was so happy with yesterdays Bento and how perfect the portion size was for me after a fast, I decided to use the same portion size for today too! 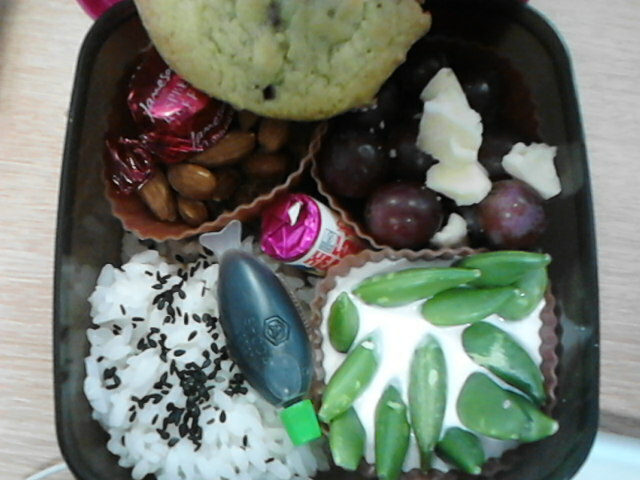 I have sushi rice with black sesame seeds and a soy sauce fish, sugar snap peas standing up in taramasalata (again), grapes with cheese, smoked and wasabi almonds and half a cookie, a single raspberry ruffle and a mini packet of love hearts. 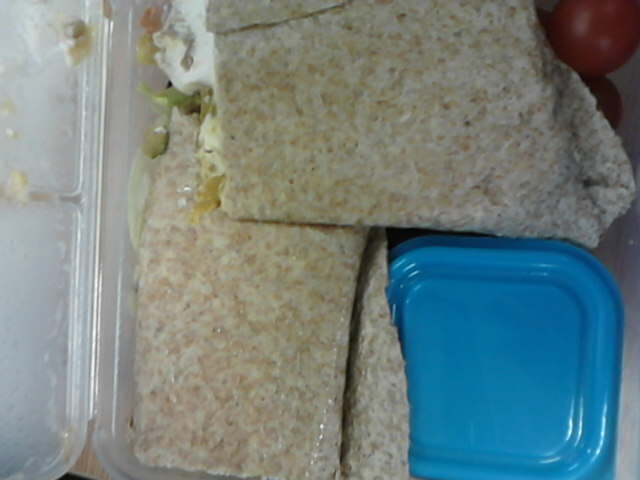 What a perfect lunch. A bit on the sweet side, but I do normally overdo it on the veg side of things usually.